The authors describe the methodology associated with the world’s largest consumer market surveys on hearing aids and hearing loss, and report their findings with a focus on the “non-auditory benefits” of hearing aids, including quality of life, relationships at home and work, sense of safety and independence, and mental health. In 2009, the European Hearing Instrument Manufacturers Association (EHIMA) initiated EuroTrak (ET) in an attempt to better understand the nature of hearing impairment, as well as the prevalence and use of hearing aids, in three of Europe’s largest countries: Germany, France, and the UK.1 For the second round of EuroTrak in 2012, EHIMA partnered with different local hearing healthcare organizations and manufacturers’ associations across Europe (Italy, Denmark, Norway, and Switzerland) and in Japan, making EuroTrak the largest multi-country, hearing-related consumer survey so far.2 The most current results from the third round of EuroTrak 2015 include Germany, France, UK, Italy, and Switzerland. MarkeTrak (MT) studies have been conducted every few years for more than 25 years in the United States by the Hearing Industries Association (HIA). The decision was made to conduct the 9th round of MarkeTrak in 2014 as a new baseline,3 converting from the traditional mail panel to an online panel for data collection. Subsequently, in addition to using similar questionnaires, both ET and MT now use the same method for data collection. A short screening questionnaire was used to collect representative information about self-reported hearing loss and hearing aid ownership within the studied countries’ populations. The samples were weighted based on census information with respect to age and gender to calculate hearing loss prevalence (percentage of people with hearing loss) and hearing aid adoption rates (owners of hearing aids as a function of people with self-reported hearing loss). The screening survey was designed to recruit hearing-impaired people without hearing aids as well as hearing aid owners. Authors’ Note: The reader should keep in mind that all data presented in this article are based on stated (self-reported) hearing loss, and thus will most likely differ from studies using objective measures of hearing loss, such as pure-tone threshold averages. While the EuroTrak studies were conducted by the same team for all reported countries, the MarkeTrak study in the United States was conducted separately. Some methodological differences between the ET and MT surveys can therefore be assumed, which may impact the comparability between the two studies for some data, and these are noted in this article. Sample sizes. Information about self-reported hearing loss and hearing aid ownership was collected from more than 120,000 people. Subsequently, a large number of online interviews were conducted, resulting in 3,702 interviews with hearing aid owners and 5,970 interviews with hearing-impaired people who do not yet own hearing aids. The distribution of the interviews across 6 countries is shown in Table 1. The largest number of interviews were conducted in the United States. Hearing loss prevalence and adoption. Table 2 provides an overview of three core metrics of hearing aid markets. Hearing loss prevalence means the percentage of the population who reported difficulties in hearing. The adoption rate is the percentage of this group who owns hearing aids, and the bilateral rate indicates how many hearing aid owners have hearing aids for both ears. While hearing loss prevalence is mainly dependent on the actual age distribution within a country (older people more often report hearing difficulties), the adoption rate is likely influenced by the socioeconomic environment and healthcare policies within those countries. Note that the adoption rate calculation is influenced by the relationship between the number of respondents who report hearing difficulty and the number of respondents who own hearing aids. It would appear that those countries with lower financial barriers to obtaining hearing aids tend to have higher adoption rates. For example, in the UK where hearing aids are provided as part of the National Health System (NHS), the adoption rate is the highest among those countries surveyed. Switzerland, which has one of the highest per-capita incomes in the world, has the second-highest hearing aid adoption rate. It is possible that variations in healthcare systems, as well as cultural differences, can impact hearing help-seeking behavior and, ultimately, hearing aid ownership. Satisfaction and wear time. Table 3 provides information on the survey respondents’ perceived levels of satisfaction with their hearing aids, the quality of counseling received, and the reported number of hours hearing aids were worn. The “% satisfied” represents those who rated their level of satisfaction as a 5, 6, or 7 on the 1-7 satisfaction scale. Hearing aid owners tend to be most satisfied in France, the United States and Switzerland, followed by Italy, Germany, and the UK. This general tendency is consistent with past studies except for the US, where satisfaction seems to have increased compared to past MarkeTrak studies. Swiss hearing aid owners reported the highest levels of satisfaction with the quality of counseling received (88%), while the Italians reported the lowest (79%). While the reported level of satisfaction with their HCP’s counseling was 91% in the United States, this data cannot be compared to the ET data as the question in the US was limited to the respondents’ experience with their HCP in the previous 5 years. In terms of reported wear-time, the respondents reported wearing their hearing aids an average of between 8-9 hours per day across the nations surveyed —which is closer to “all day” than to “only in specific situations.” The respondents in the US reported the highest wear-time, but this data cannot be compared with the ET values as only daily hearing aid wearers were asked to respond to this question in the MT survey. The most obvious benefit of amplification is improved audibility leading to decreased impairment, activity limitation, and participation restriction—what the World Health Organization (WHO) defines as disability.4 Hearing aids also appear to have “not so obvious” benefits. In recent years, for example, an increasing number of studies have investigated the relationship between hearing loss and depression, including the potentially positive contribution of professional hearing care.5-7 Similarly, the role of hearing aids and social engagement has been studied.8 Therefore, it was of particular interest for both the ET and MT9 studies to probe into these associations. While it is likely that some of these non-auditory benefits are influenced by factors other than hearing, it is, nevertheless, impressive that many hearing aid owners reported several non-auditory benefits associated with their hearing aid use. Better quality of life. Table 4 illustrates, as a function of country, the percentage of respondents who reported that hearing aids rarely to regularly improved their quality of life. The data suggest that, on average, more than 8 of 10 hearing aid owners feel their hearing aids occasionally or regularly had a positive impact on their perceived quality of life, with residents of Switzerland reporting the highest positive impact. Better relationships. Table 5 illustrates, as a function of country, the percentage of respondents who reported improvements in their home and work relationships since wearing hearing aids. About half of all hearing aid owners believe their relationships at home or at work improved due to their hearing aids suggesting that improved communication performance had a positive impact on the nature of their home and work relationships. (Note that if somebody answered “the same” we did not count this as a positive impact). Residents of Italy reported the highest positive impact of hearing aids on their relationships both at home and at work. Better sense of safety and independence. Table 6 illustrates, as a function of country, the percentage of respondents who reported improvements in their sense of safety and independence. As can be seen, about half of the hearing aid owners felt an improved sense of safety and independence as a result of wearing hearing aids. Again, residents of Italy reported the highest positive impact of hearing aids on both their sense of safety and their sense of independence. Based on the MT and ET data associated with quality of life, home and work relationships, and safety and independence, it would appear that hearing aids have a positive impact on the individual’s overall sense of well-being. Better memory. Table 7 illustrates, as a function of country, the percentage of hearing aid owners and non-hearing aid owners who reported an increase in forgetfulness over the last year. There was a tendency for those with hearing aids to report being less forgetful than individuals with hearing difficulty who did not wear hearing aids. The exceptions included Italy with high levels of reported forgetfulness among both hearing aid owners and non-owners, and Germany where the reported levels of forgetfulness did not differ between the two groups. Benefits at work. Table 8 provides data on the perceived usefulness of hearing aids in the work environment. 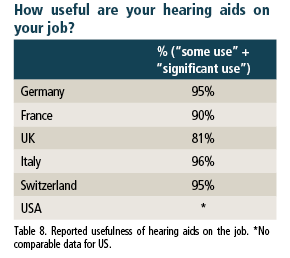 With the exception of the UK, where 81% of the respondents reported that hearing aids were useful, about 9 out of 10 hearing aid owners across the EU reported that their hearing aids were useful on their job. Better mental health. A report by the World Economic Forum and the Harvard School of Public Health9 in 2011 concluded that “the global cost of mental health conditions in 2010 was estimated at US$2.5 trillion, with the cost projected to surge to $6.0 trillion by 2030. About two-thirds of the total comes from indirect costs and the remainder from direct costs.” Indirect costs refer to the invisible costs associated with mental illness, such as lost productivity and income owing to disability or death. The PHQ-2 is a two-item screening questionnaire designed to determine how often an individual is bothered by having “little interest or pleasure in doing things” and “feeling down, depressed or hopeless” over the previous 2 weeks. The PHQ-2 is scored from 0-6 with a score of 2 (where the % of truly identified positives related to all positives is highest: sensitivity = 92.7) is used as the cutoff point. The values in Table 9 represent the percentage of people with a PHQ-2 score ≥2, suggesting that these people have a probability ≥21.1% of having a major depressive disorder. There was a tendency within each country for those with hearing aids to have a lower probability of having depressive disorders than those reporting hearing difficulty who did not wear hearing aids. The exception was in Italy where the PHQ-2 score and likelihood of major depressive disorder was high for both groups. For many decades, investigating the benefits of amplification and hearing rehabilitation has focused on measuring improvements in audibility and speech recognition performance. More recently, we have seen an impressive expansion of hearing rehabilitation research to include an exploration of the associations between hearing loss, and its treatment, on such non-auditory domains as health-related quality of life, depression, social isolation, and cognition, to name a few. The exceptionally large, representative, and multinational EuroTrak and MarkeTrak surveys offer a unique opportunity to add to this body of research in an attempt to further understand the impact of better hearing—as achieved through current hearing aids—on the well-being of individuals and, potentially, the society in which they live. Hougaard S, Ruf S. EuroTrak I: A consumer survey about hearing aids in Germany, France, and the UK. Hearing Review. 2011;18(20):12-28. Hougaard S, Ruf S, Egger C. EuroTrak + JapanTrak 2012: Societal and personal benefits of hearing rehabilitation with hearing aids. Hearing Review. 2013;20(3):16-35. Abrams HB, Kihm J. An Introduction to MarkeTrak 9: A New Baseline for the Hearing Aid Market. Hearing Review. 2015;22(6):16. Monzani D, Galeazzi GM, Genovese E, Marrara A, Martini A. Psychological profile and social behaviour of working adults with mild or moderate hearing loss. Acta Otorhinolaryngol Ital. 2008; 28(2)[Apr]:61-66. Mener DJ, Betz J, Genther DJ, Chen D, Lin FR. Hearing loss and depression in older adults. J Am Geriatr Soc. 2013 Sep;61(9):1627-1629. World Economic Forum and Harvard School of Public Health. The Global Economic Burden of Non-communicable Diseases. Sept 2011.